Hello ... Hello ... my old friends ... It's great to see you once again! If I were absolutely honest, I would say that "Mr. Blue Sky: The Story of Jeff Lynne and ELO" contained precious little of ELO per se. This is not a criticism, just an observation. 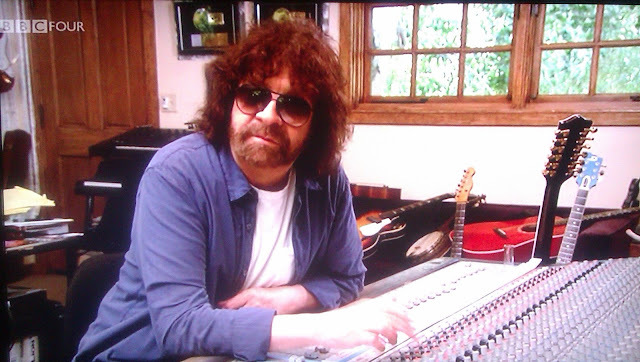 But what this excellent documentary did contain was indeed the whole story of the man Jeff Lynne practically to birth to here in Yours Truly 2012 - and a whole lot more! We were treated to the inside view of the studio, which doubles as his LA home, in quite some detail. With contributions from Olivia & Dhani Harrison, Paul McCartney, Tom Petty, Joe Walsh, Fred the Robot, Barbara Orbison, Eric Idle, Richard Tandy, Ringo Starr as well as rare home movie footage of George Harrison, Del Shannon, The Beatles and The Traveling Wilburys and a superb tribute to the much loved Roy Orbison, the film clearly demonstrated the reputation, work ethic and even sense of humour of Mr. Lynne. For a musician, songwriter, producer and arranger to have not only worked with but with his peers and also his musical heroes, it speaks volumes for someone who seems happier locked away in his home/studio rather than on stage or the TV show couch. Was one of the best music documentaries I've seen - not overly long and pretentious like so many others! As you mentioned, there wasn't a lot about ELO in there but even the most ardent fan wouldn't begrudge the incorrect titling upon witnessing such a beautifully crafted piece of film making; it's almost as intricately assembled as one of his records. Almost. I know many people who would love the DVD Keith and wondered if you knew when the release might be as I can't find it anywhere. I agree, this was a superb documentary. A musician friend of mine, who I've known since Infant school in Birmingham emailed me after the broadcast and (in short) said he now totally understood why I was such a fan of ELO and Jeff Lynne. The acoustic set broadcast afterwards was amazing. Jeff's voice is incredible! I've watched that twice more already and it was just as powerful. What I liked about these productions is, as Simon said, they were beautifully shot. Usually these days a pretentious director insists on cutting away to black and white shots from the side for no reason and the cameraman shoots as if they are doing their best to avoid getting the subject in frame. This wasn't like that and all the more pleasing and refreshing for it. Maybe they should do a "Story of ELO hanger-ons". That should include the other ELO members and get Jeff Lynne's approval. I love his G. Lynn story. His sense of humor is wonderful!